The Singers' Hall was one of the king's favourite projects and next to the Throne Hall the most important room in the castle. 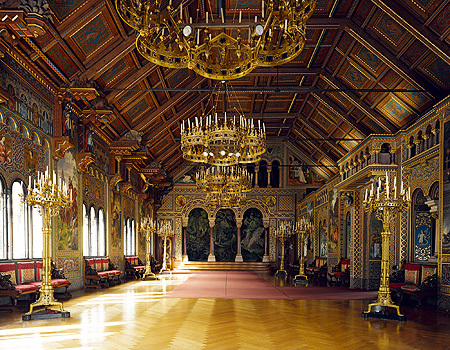 It occupies the whole of the fourth floor in the eastern section of the Palas and is a combination of two historical rooms in the Wartburg – the Festival Hall and the Singers' Hall. The Singers' Hall in the Wartburg was allegedly the location of the famous Singers' Contest which is also featured in Richard Wagner's opera "Tannhäuser". In 1867 Ludwig II went at Wagner's suggestion to look at the Wartburg. 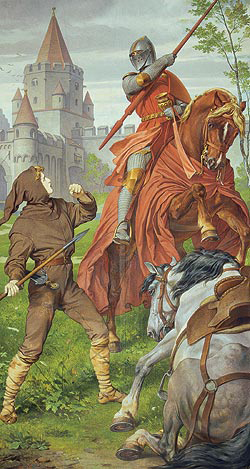 Parzival fighting the red knight. On the short, western side is the Singers' Bower, separated from the rest of the room by steps and three arcades, and with a small gallery above it. The murals in the hall do not however deal primarily with the Singers' Contest but with the saga of Parzival and the Holy Grail. The bower, which resembles a stage, is painted with a forest scene – the sacred forest that surrounds the Castle of the Holy Grail. Parzival's son is the "Swan Knight" Lohengrin, with whom the picture cycle ends. Depicted on the high coffered ceiling are the signs of the zodiac. Like the Throne Hall, this hall was also never used for large banquets or musical performances: it was Ludwig's monument to the knights and legends of medieval times. Tannhäuser, Parzival and Lohengrin were the figures with whom the king had identified since his youth. Running along the long, north side is a gallery, with Flayetanis and Kyot, the authors or translators of the Grail saga, depicted on the consoles. Behind the retaining wall of the gallery is a passage with a coloured coffered ceiling painted with scrolls bearing the names of minnesingers. On the opposite, window wall, the ceiling consoles are carved with figures and symbols connected with the Parzival legend such as the winged Lucifer, who during his fall lost a precious stone from his crown, from which the Holy Grail was later made.